You will enter Newcastle on the R34 from Memel. As you enter town, you will come to a T-junction at a traffic light. Turn right onto Allen Street. Continue on Allen street through town (you will go through multiple intersections). As you are coming out of town on the opposite side, still on Allen street, you will reach an intersection with Century Casino on your right. Go through this intersection. The next road right is Hilldrop road (no traffic light). Turn right into Hilldrop road. If you reach the T-junction with the N11 to Ladysmith, you have missed Hilldrop road. Travel down Hilldrop road for about 600m, and you will come to No 9 Hilldrop road, Hilldrop Bed and Breakfast, on your left. You will enter Newcastle on the N11 from Ladysmith. After you have passed the Engen and Wimpy on your left, you will come to a slip way just before a traffic light with Allen Street. Take the slipway left onto Allen street. Hilldrop road is your first road left. 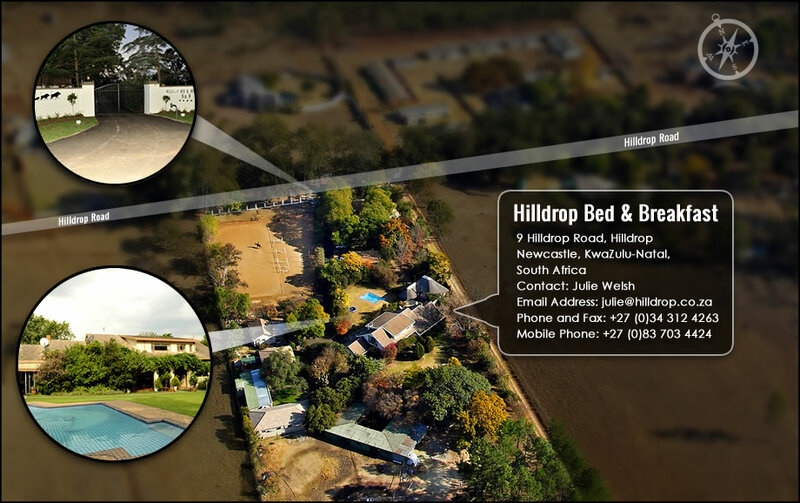 Travel down Hilldrop road for about 600m, and you will come to No 9 Hilldrop road, Hilldrop Bed and Breakfast, on your left.